We all remember the Rolling Stones Song which states “I can’t get no satisfaction”. I’m here to say that they were wrong, or at least not completely correct. I had the privilege of attending a grand opening party at one of our projects Tuesday evening. The guests gathered in and around the clubhouse at The Apartments at Goose Creek in Fishersville, Virginia. The building proved to be exactly the right size for the gathering and the design was well received by the guests as they wandered around checking the place out. It would seem a no-brainer that this was a satisfying experience to the architect of record. 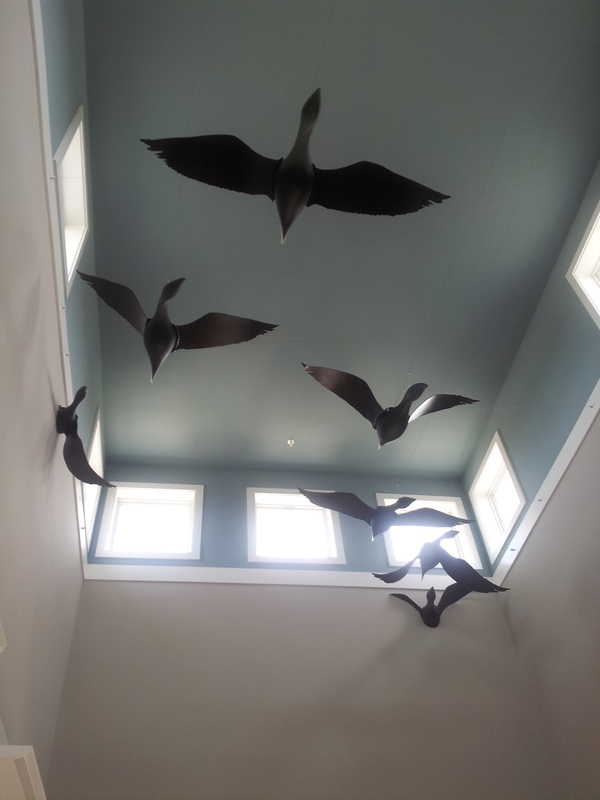 Seeing people’s reaction when they entered the building where they could immediately see a panoramic view of the Alleghenies in the distance and the half dozen geese hanging from the ceiling makes what we do worthwhile. As the evening wore on and the sky made its transition from day to evening, the exterior lights came on and changed the building to its nocturnal persona which was also well received by the guests and confirmed that the design lighting levels were correct. The use of photometric software proved to be valuable, as the lighting levels made the trek between the clubhouse and the model apartment comfortable for the guests. I have to admit that I received a lot of complements on the project as the evening progressed, but I would be remiss if I didn’t acknowledge the team that made the vision a reality. Goose Creek is the second consecutive collaboration between the three participants. I have to acknowledge our client, Denise LaCour of Denstock LLC whose vision over our 25 plus year collaboration has changed the landscape of our community in very positive ways. I would also like to acknowledge our contractor, KBS, Inc. that transformed our documents into reality. Their management and on site teams were top notch. My partners and staff were instrumental in producing the design and documentation. This collaboration bears out the quote attributed to Tony Bennett of the University of Virginia Men’s Basketball program which states “If you want to do something fast, do it alone. If you want to do it well, do it together”. So as our practice of architecture continues, it is impossible to avoid the feeling of satisfaction that comes from watching the work of a great team perform well.